A bit of background information is called for prior to reviewing this album. Purple Pyramid is the prgressive/psychedelic division of Cleopatra Records, the far-out label that brought us some stunning spacerock back in the 1990’s, including re-igniting the careers of ex-Hawkwinders Nik Turner and Simon House, while also releasing a range of covers albums (Pink Floyd, King Crimson, Brian Eno, Hawkwind) of variable quality. Billy Sherwood, multi-instrumentalist producer and associate of the 1990’s Yes, also has a long history of organizing tribute albums – XYZ – A Tribute To Rush, Return To The Dark Side Of The Moon, Dragon Attack – A Tribute To Queen – using a stellar cast of musicians from such bands as Yes, Deep Purple, Hawkwind, Gong and King Crimson. Nektar, on the other hand, just have a long history full-stop (going back to their first release Journey To The Centre Of The Eye in 1971), plus a revolving door of musicians, none of whom can claim the distinction of having played on every single Nektar album. The combining factors of updating progressive rock glories, cover versions and high profile guest stars are key to the release of A Spoonful Of Time. 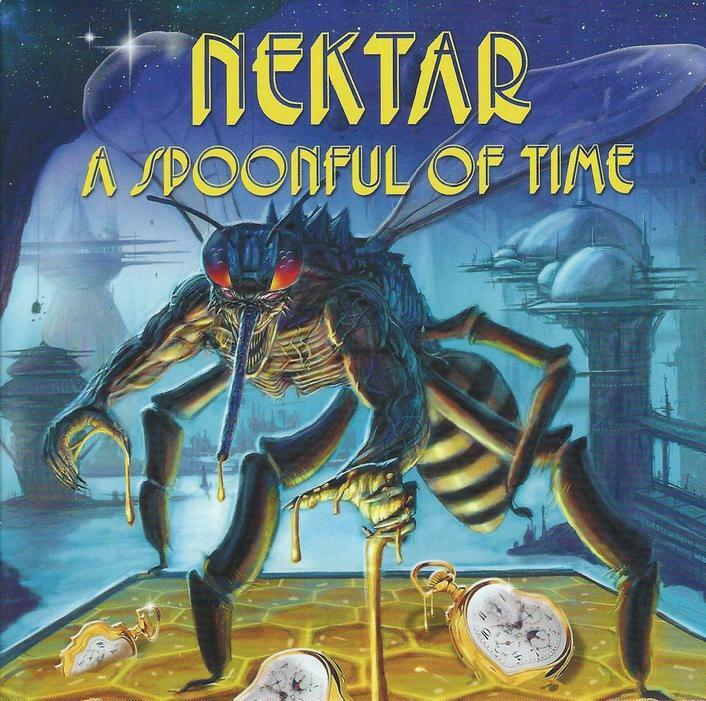 Although released under the Nektar brand name, and featuring long time band members Roye Albrighton (vocals and guitar) and Ron Howden (drums) – the contributions of current the Nektar keyboard player being hard to gauge behind a host of keyboard-toting guest artists – the very existence of A Spoonful Of Time owes as much to Sherwood (who mixed the album and plays on almost all the tracks) and Cleopatra as it does to Nektar. The appearance of a covers collection this late in a band’s career hints at burned out creativity, but at least provides some new music beyond yet another live album or collection of material from their own archives (to be fair, Nektar have got a brand new studio album – Time Machine – in the works for 2013, which would fly in the face of burnout accusations). Anyway, that is enough background history and speculation, now on to the music itself. Cover or tribute albums generally seem to take one of two divergent paths, either that of complete destruction and reconfiguration, or of faithful homage to the original tracks. In this regard, Nektar and Sherwood have taken the latter, and safer, path. A version of Rush’s Spirit Of The Radio, for example is almost note perfect in its backing track, with only Geddy Lee’s unreproducable vocals, and parts of the guitar solo providing any notable difference from the original. Probably the greater amount of risk-taking is in the actual choice of who and what to cover. A few of the songs – 2000 Light Years From Home, Riders On The Storm, Can’t Find My Way Home – predate the career of Nektar, and could therefore be seen as being an influence on the original members of the band, as well as being fan-pleasing favorites. Others, like Toto’s AOR workhorse Africa, The O-Jays’ For The Love Of Money, and aforementioned Spirit Of The Radio are frankly quite baffling as far as song selection is concerned. Prog-lite favorite Sirius (originally done by The Alan Parsons Project) serves as a reasonable entree, with some fine guitar work from Albrighton. Steve Miller’s Fly Like An Eagle gets a kind of soul-funk workout, sounding a little like The Neville Brothers’ cover, and featuring (unlikely as it might seem) Brainticket’s Joel Vandroogenbroeck on keys and flute, with additional keyboards by Geoff Downes (Buggles/Yes/Asia). Pink Floyd chestnut Wish You Were Here is played pretty straight, and could actually fit right into the greater Nektar canon; Tangerine Dream’s Edgar Frose supplies keyboards and Albrighton takes a sizzling guitar solo. For The Love Of Money is one of the more unlikely tracks to appear on a prog-related album, but it works really well, with a decidedly funky rhythm track laid down by Sherwood and Deep Purple’s Ian Paice, and surprisingly tuneful sax from Nik Turner, pretty much a compulsory addition to these types of projects. Can’t Find My Way Home, featuring members of Yes, Dream Theater and King Crimson, neither adds nor subtracts from the Blind Faith original, although Steve Howe’s delicate acoustic picking is worthy of mention. As far as The Rolling Stones’ pioneering spacerock masterpiece 2000 Light Years From Home is concerned, it would seem nigh impossible for any version of this song to be anything other than superb, and the welcome addition of Hawkwind’s Simon House on violin is just the icing on the cake. ’80’s bass shredder Bill Sheehan and The Zombies’ Rod Argent add significant punch to Riders On The Storm, the latter bringing his signature Hammond sound along for the ride. Ginger Baker’s appearance on Blinded By The Light is unexpected but unremarkable, but the song takes a strange Nektarised turn with a lengthy guitar solo, a Chopsticks-style piano line from Opeth’s Joakim Svalberg. Simon House is back on violin for Roxy’s Out Of The Blue, while King Crimson’s David Cross takes his turn with a bow on the prog-folk version of Neil Young’s Old Man (another unlikely but well executed selection). Klaus Henatsch nails Gary Wright’s keyboard parts on Dream Weaver, while Mahavishnu violinist Jerry Goodman also puts in a good performance. Like Nik Turner, Rick Wakeman is generally on the guest list for these Billy Sherwood projects, and he appears on a lounge-lizard version of I’m Not In Love; Jan Vandroogenbroeck returns with flute and sitar, a million light years from his Cottonwoodhill origins. He is also on Africa, which features Patrick Moraz (Yes/Moody Blues) on keys and former Toto vocalist Bobby Kimball (who also sang on the original recording). It is perhaps an unfortunate choice of closing number, as its AOR sheen is unlikely to appeal to the progressive rock fans who would be the usual target audience of Nektar. So there you have it. A non-essential but pleasant and occasionally exciting album of covers featuring a vast array of talent. Not a good first point of entry for Nektar’s catalog perhaps, but there is plenty here that will appeal to the less-purist progressive rock aficionado.